Introducing the Ab-Scent Edge. Let's just say that this old 10-pointer has a nose for trouble. With his finely-tuned sniffer, you may never get close enough to get a shot. Unless your clothing has Ab-Scent. You see, this revolutionary, scent-stopping fabric makes you and everything about you completely undetectable. Even to his extraordinary sense of smell. Ab-Scent performs perfectly in any climate or season, for the life of the garment. With Ab-Scent, fabric durability is maintained without compromising comfort or breathability. There are no extra layers or special laundry requirements either. And because it's more economical than other methods, you'll have money left over. Remember, don't arouse his suspicions any more than necessary. 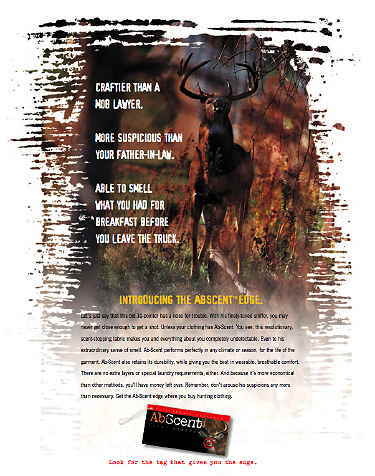 Get the Ab-Scent edge where you buy hunting clothing. Written several years back for the new client of a small agency in Rocheter. A couple people actually contacted me after finding the ad on my previous website. They wanted to buy the product but couldn't find it. I guess the client's distribution was not quite what they had hoped.